Nelson Labs now offers competitive turnaround time and pricing for pure cultures sent on a general growth medium. As defined in USP <1113> a pure culture is usually accomplished by a “successive streaking of the colony of interest in a quadrant pattern” as demonstrated in the image. This test bypasses the time required to grow and isolate the organism and allows the sponsor to choose a 1, 3, or 5-day turnaround time for genetic identification, offering flexibility in price and delivery time. For additional microbial identification options please see our general Organism Identification page. The Organism Identification tests are performed following bioburden, environmental monitoring, tissue testing, microbial limits, and on sterility or BI positives. Gram stain: Isolated colonies are examined for colony morphology, Gram reaction and cell morphology. Vitek: The microorganism is streaked onto the appropriate medium and incubated for 18 – 70 hours. It is then suspended in 3 mL of saline and tested using the appropriate card type. Identification is based on patterns of biochemical utilization in a 64-well card and through the introduction of Advanced Colorimetric™ technology. A Gram stain is included as part of the test, so that the appropriate card type is chosen. Classical mod identification (genus only): A lactophenol cotton blue mount is used to visualize the morphological structures of the mold. The identifications are made based on morphological similarities to known organisms. Genetic identification: This uses DNA instead of traditional biochemical reactions. It entails collecting the DNA from a microorganism (16S ribosomal DNA for bacteria and D2 region ribosomal DNA for fungi), creating many copies of the target region, then sequencing and comparing the unknown sequence to the MicroSeq library. 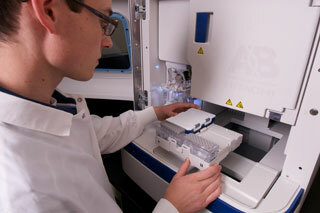 If a match is not found in the MicroSeq library, a public database may be searched. A Gram stain is done along with the genetic identification when testing involves sterility or BI positives and other liquid preparations. The Gram stain is done to verify pure culture. It provides a phenotypic component which makes the identification more complete. Gram stains are recommended to determine if organisms are bacteria or yeast. If you have additional questions about Microbial Identification test services, or would like to consult with the experts at Nelson Labs, just send us a request or call us at +1 (801) 290-7500.